A manor house existed here as far back as 925. In 1020 possession passed into the hands of Berthric, who was the ambassador at the court of Baldwin—the count of Flanders. Baldwin’s daughter Matilda fell in love with Berthric and sent him many letters proposing marriage. Berthric wasn’t interested and hurried back to England. Unfortunately for him, Matilda went on to marry William of Normandy. After he conquered England, Matilda lost no time persuading her new husband to confiscate all of Berthric’s lands and imprison him in Winchester, where he later died. In 1087 Thornbury passed to Robert Fitzhamon for services rendered to the crown. With few lapses, it remained in his family, the Staffords, for 28 generations. In 1444 the Stafford family became titled, and Humphrey Stafford was named the first duke of Buckingham and a Knight of the Garter. In 1508 the third duke of Buckingham, favored by King Henry VII for his aid in crushing the Perkin Warbeck revolt, received a permit to build a castle—the foundation of today’s structure. The duke became a great friend of Henry VIII until a disgruntled servant repeated to cardinal Wolsey some gossip about the duke’s possibly having some designs on the royal succession. Henry believed the gossip and arrested Buckingham while he was watching the construction of his castle. Imprisoned in the Tower of London, he was found guilty of high treason and beheaded. The duke’s lands were confiscated and the Tudor family made use of the castle for the next 35 years. Henry VIII and Anne Boleyn spent ten days here in 1533. Mary Tudor lived in the castle for several years until she gave the property back to the Stafford family. Thornbury remained unoccupied for nearly 200 years and gradually deteriorated. Restoration has continued slowly since the 18th century. In 1727 the Staffords sold it to a cousin, Thomas Howard, the 8th duke of Norfolk, in whose family it remained until 1959. For those incurable romantics among you who crave history, reserve the Duke’s Bedchamber. After climbing a circular stone staircase, you’ll sleep in the bedchamber once occupied by King Henry VIII and Anne Boleyn. Thornbury is about a 1/2- hour drive north of Bristol. Exit from either the M4 or M5, depending on which direction you’re coming from, onto A38. Watch for side road B4061. The castle gate is next to St Mary’s parish church. Nearby: golf; horseback riding; fishing; excursions to the Cotswolds, Bristol, Bath, and South Wales. Yes. Receptions. Inquire hotel for details. 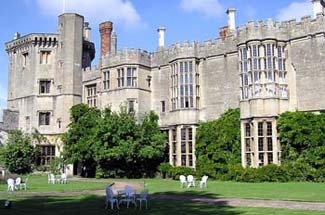 Anyone who thinks a castle is a gloomy, damp, and cheerless place to spend the night is sure to be impressed by the warmth and coziness of Thornbury Castle—the last major fortified manor house built in England. Upon entering the castle, look closely over the gateway and you will find an inscription by its former owner, the duke of Buckingham. Badges of his coat of arms are also found over the gatehouse, windows, and fireplaces. A double brick chimney on the south side is unique in England. The oriel windows on the same side are fine examples of tracery (one has 720 panes of curved glass). The library has a fine view, over hedges and flowers, to the spire of the village church. No expense has been spared to transform the individually furnished guest rooms into ultimate retreats. Four-poster beds, beautifully carved in a 16th-century style, were especially commissioned for the rooms. High ceilings and tall mullioned windows looking out over the gardens remind you of the castle’s origins. The Tower Room is exceptional. Its walls are covered in silk, deep rose-colored brocades frame the canopy bed, and a sitting area and fireplace provide coziness, not to mention its bathroom has gold-plated fittings. The paneled walls, heraldic shield, and open fireplaces in the baronial dining room create a cozy atmosphere for sampling the first-rate cuisine. Thornbury produces its own Riesling wine from vineyards on the estate.